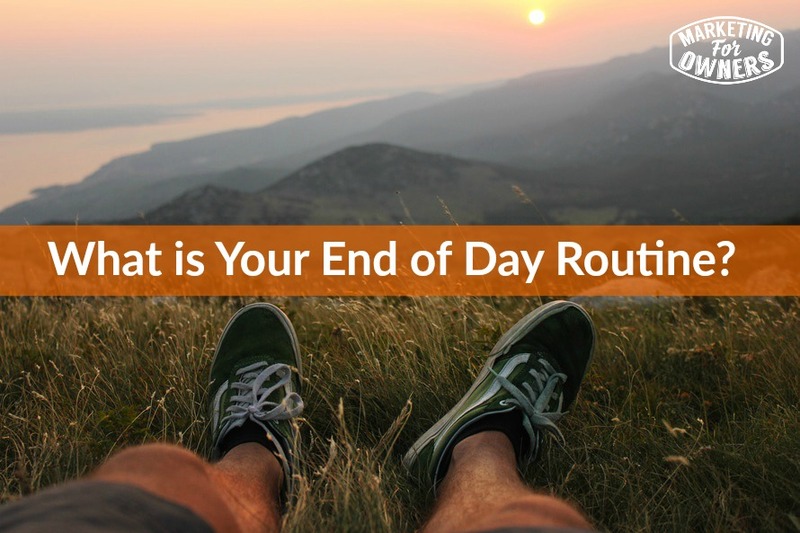 At the end of each day, what do you do? Now, this can be at the end of your working day, or this can be at the end of your non working day. Now a days, many of us find ourselves stuck on our devices which can range from a television, smart devices, and all the way to a laptop computer. Now, usually this happens right before we go to bed and that is not a good thing for you. Why not think of something else to do? How about having a routine? This can also be at the end of your working day. If you have a routine, this will help you to remember to do things that are possibly worth doing. It helps it to become a habit. And next week — while I am tackling the evening today, next week I will be talking about how to get going at the start of your day. Well here is a suggestion. Now, please forgive me, because to some of you this may sound a bit wishy washy, a bit American for those of you living in England, or even a bit “hippieish”. If you think more positively, then your brain over time will think more positive. You will become a more positive person. So here’s what I am going to suggest you do at the end of every day. Now, there are all kinds of apps out there you can download like Gratitude Log and such that will help you to keep a diary that is almost like a journal that will help you keep a list of what you are grateful for. So think, what are you grateful for today? This can be people, it can be things, anything that you are grateful for. If you try to, for instance, write down 5 things or 5 people, after a few days, you will start to run out because you will list all the easy ones first like spouse, parents, kids etc. But when you start to think, it puts your brain into a different sort of mode. First of all, it takes you away from work. That’s a good thing. It gets your mind out of work mode and makes you to think differently. Now, if you have to think of who or what you are grateful for, that is a good thing. Because, once you start to think harder about it, you start to think of individual things. It could be about the lady you saw at the supermarket who was checking out behind you and pointed out that you had left your jacket hanging — or something along that lines. It could be something a little more out there. Again, this could be a challenge, because you might think, “I haven’t helped anyone.” Well — why not? Why haven’t you? Should you have? If you have a staff or a team, why not help them to better themselves or to improve themselves in work and outside of work? You are doing it, so why not help them? You are listening to podcasts, and learning and watching videos. You are doing this to better yourself, so why not try to explain these benefits to others who may not even know they exist? How about if the tables were turned at the grocery, and you helped an elderly woman get her groceries from the cart into the back of the cart? Why can’t you do something like that? Imagine how that will make you feel. If you are in McDonald’s, and you see a worker cleaning up a mess from someone else who has been eating, why not walk up to them and thank them for doing such a great job keeping the restaurant clean. Imagine how that will make them feel. Seeing their smile will make you smile. You can do something like this and make it a daily habit and then record it. Personally, I use a free online tool called IDoneThis.com. I have been using it for years, and I think I even talked about it in another podcast before. If you are recording what you have done, then you will feel a sense of achievement. Remind yourself what you did. If you set up a meeting, hashed out a new project, created ideas for another project, then you did something. There are a lot of inspirational business books out there, but one of my favorites is from Brian Tracey who wrote Eat That Frog. In this book, he suggests that when you have a todo list, instead of doing what we always do every single day, me included, we always pick the easy ones and get those done first. He suggests instead to choose the hardest one, and do that one first — eat that frog. Do the hardest one first, because everything after that becomes easy. It’s got to be done and the longer you put it off, the harder it becomes. So take some time in the evening, to decide what you are going to do tomorrow. Don’t wait until the day of because, once you do, it will take more time, more thinking, leaving the door open for more procrastination. So in your todo list, don’t have the extensive list out in plain sight. Have it hidden. Only keep out your list that has 2-3 of the most important you want to get accomplished. Once you have those done, then you can move forward. If you have picked a hard thing to get done, then you can choose another one to get done. Now that you have done those, you can choose some more. Now, you have a routine. You can record it in a Google Doc, or in a journal — it doesn’t matter, this is just for you. I personally don’t write stuff like that down in a journal, but I know a lot of people who do. It’s a good thing because imagine years later, looking back at the ideas and the things you accomplished. You will have a sense of pride and be a much happier person. Today is Thursday and that means it is time for a drive time podcast. 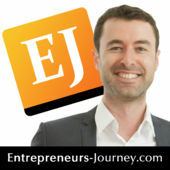 Today I am going to recommend The Entrepreneur’s Journey by Yaro Starak. Yaro is a very likeable guy. He is Canadian, but spent much of his time in Australia (so a lot of people think he is Australian). He has gone through an entrepreneurial journey. He is a very well known blogger. He has detailed everything he has done and learned and how you can do the same. He has lot of followers, and he is so like us. He saved up to buy a car, and he didn’t buy a Lambo or anything like that– just a regular car. He is very likeable. Go look him up. You will really like him a lot. See you tomorrow with the weekend challenge.